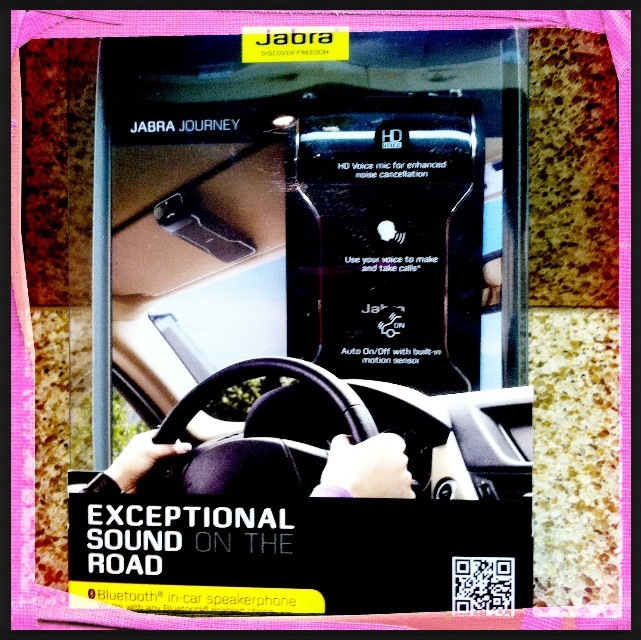 This mommy has been using the Jabra® Journey, Hands-Free in-car Speaker for over 3 months now. Practical since I’m all about fashion over function. I often see both women and men flubbing up fashionable trends by wearing not-so-hip consumer electronics (AKA: Bluetooth), causing me to cringe. Mhmmm, Bluetooth earpieces are just not chic and should never, in my humble opinion, be worn outside of the car. Please don’t be misguided though, I completely understand Bluetooth’s necessity as I’m native to a state whose law prohibits hand-held cell phone use while behind the wheel. Did you know that violators can be fined in excess of $300? Hence, illuminating the reality that this Bluetooth “situation” is a colossal dilemma for someone who commutes hours per day. I recognized that the new law was being strictly enforced and I knew it was time to start shopping around for just the right hands-free device. Hmmm… the possibilities. Over the years I have tried device after painful/faint/shoddy hands-free device and had, through much anguish, conceded to ever speaking on the phone in my car again… Until the day that I received the Best-gift-EVER! My sister, a Manhattan mommy on the go, sent me a Jabra® Journey Bluetooth Speaker that’s secure; clipping discretely and sturdily onto the visor of my car (right next to the garage door opener.) Sleek looking too. Set up was a breeze. “She,” my new Jabra, swiftly talked me through… yes, explaining in detail, the set-up process. User friendly and it worked immediately. Sweet! Another cool feature is that you can sync your phone’s contacts to the device and “she” (similar to iPhone’s Siri) announces the incoming call by name, “Call from, Brian.” All I have to do is say, “Answer” and our hands-free conversation materializes… easy as pie. Making calls out is just as simple. Effortless. The call quality is remarkable. Jabra highlights their Enhanced Noise Cancellation Technology (not just a figment of my imagination) which cancels out background noise AND allows my “Carseat Dancers,” AKA 3 ½ and DEA 2 ½, to both hear and speak to callers clearly from the back seat. 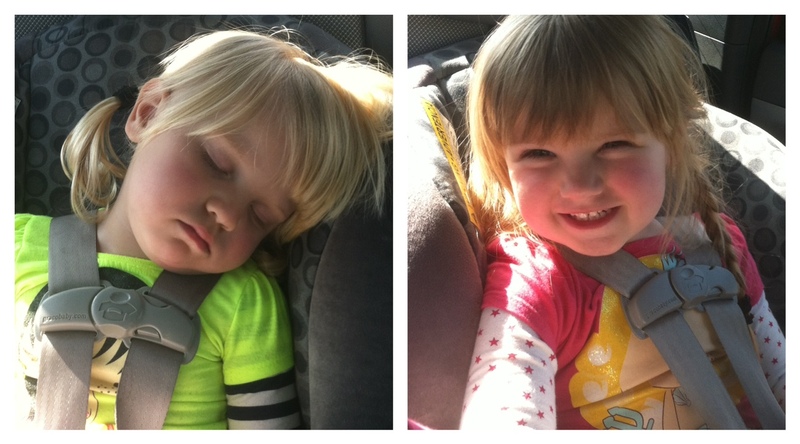 Technology that is also brilliant at keeping THEIR backseat antics out of MY conversations. Let me talk about the cost. 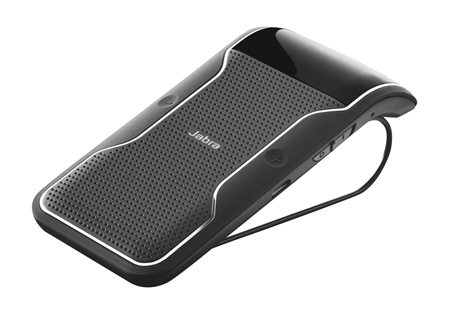 You can find this AWESOMENESS for merely $79.99 at www.Jabra.com or at any electronics dealer. I know you’ll agree that every cent is well spent! The Jabra® Journey’s longevity is impressive too. The included car charger is super duper convenient and the speaker does not require a constant connection. (Unlike other hands-free devices, you don’t keep the device plugged in while driving.) I have left the speaker plugged in over night a couple of times. Let me give you the lowdown though, it has held a charge for over a month at a time! You can talk for up to 20 hours in one cross-country sitting or get 45 days standby time. Not that I’ve done this but stoked that it’s possible… if ever. Jabra even comes with a proverbial cherry on top. You can stream audio from your mobile phone, mp3 player or other device directly to the speaker, so you can enjoy music, audiobooks and even podcasts while you’re driving or take the speaker “to-go” and listen outside of the car. Yup, pretty cool feature for anyone on the go. 5 STARS for the Jabra® Journey Bluetooth Speaker! Ahh… Jabra®. It’s such a relief that “Mommy on the Go” can remain stylish (no dorky earpieces here) and never miss a call because she’s driving. This is a Hands-free Zone! P.S. Please feel free to SHARE & follow me on Twitter @CarseatDancers. This entry was posted in Carseat Dancers, Gifts, Mommy on the Go, Review and tagged @CarseatDancers, Bluetooth, commute, Hands-free, Jabra®, mommy on the go..., Review, Roadtrip, style, travel. Bookmark the permalink. Thank you I have been looking to buy something like this forever but not knowing the quality of this brand.